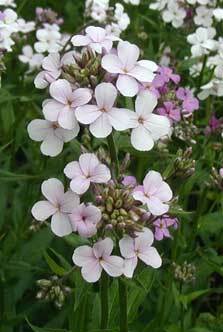 Driving along a Pennsylvanian country road during the months of May or June, you are likely to see some patches of tall white, pink or violet flowers, called Dame’s Rocket or Dame’s Violet. 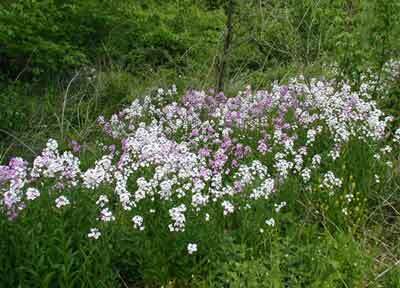 White and violet patches of Dame’s Rocket give a splash of color to the Pennsylvanian roadside. 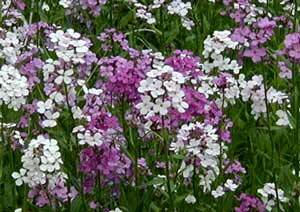 The flowers of Dame’s Rocket, Hesperis matronalis, cluster at the top of one to three feet tall stems. Blooms with four petals that eventually give rise to erect seedpods indicate this garden escape is a member of the mustard family. Phlox spp. 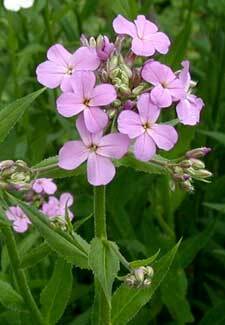 are similar in appearance although the flowers have five petals and you would most likely find phlox blooming in a wooded area. Violet and white blooms of Dame’s Violet have four petals. The white blossoms may have a tinge of pink or purple and some flowers are variegated. The stamens and style are retained mostly in the flower tube. Dame’s Rocket blooming in white. A few small flower clusters project from the leaf axils. Finely toothed leaves attach directly to the hairy, stiff stem. Violet flowers of a roadside beauty. 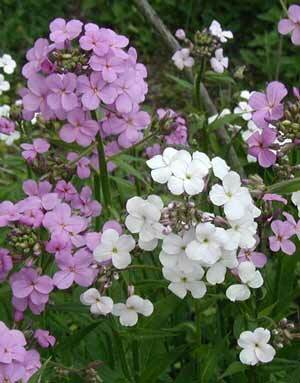 Dame’s Rocket will catch your attention with its bright colors and great patches of many flowers. Great write up – have been curious about this flower for a long time. Thanks! The Dame’s Rocket is blooming wildly right now – at least in our part of PA! The pinks and purples and white flowers alongside the roads and highways are really beautiful. So nice for a roadside weed, isn’t it? Thanks for stopping by and come back again. Thanks for chiming in, Kate! Dame’s Rocket is as bad of an invasive as garlic mustard. As a professional conservationist, I see first hand how it damages ecosystems in the midwest and elsewhere. Very pretty but keep in mind how much effort and money is being spent to control this invasive. Looks can be very decieving! Please stop gardening with this plant! Is it warranted to spend any money and effort to attempt to remove a plant that was moved to North America way back in the 17th century (according to Wikipedia)? That’s a serious question I have about conservation efforts in general. If a state warrants the removal efforts are worth it but an adjacent state does not, isn’t it a little futile to do so? You must be maddened at times over these situations! What native species has this prolific mustard replaced? Haven’t any butterflies or other insects come to use it over the centuries? I was in a meadow in southern New York this past weekend and the view was outrageously beautiful due to the plethora of Dames Rocket in bloom. I can see how the plant is very invasive, but I still wonder at the actual damage it’s causing. Any comments from the professional?